It took five straight games of five-plus yards per carry, but Aaron Jones finally appears to have locked down the top spot in the Green Bay Packers’ backfield. 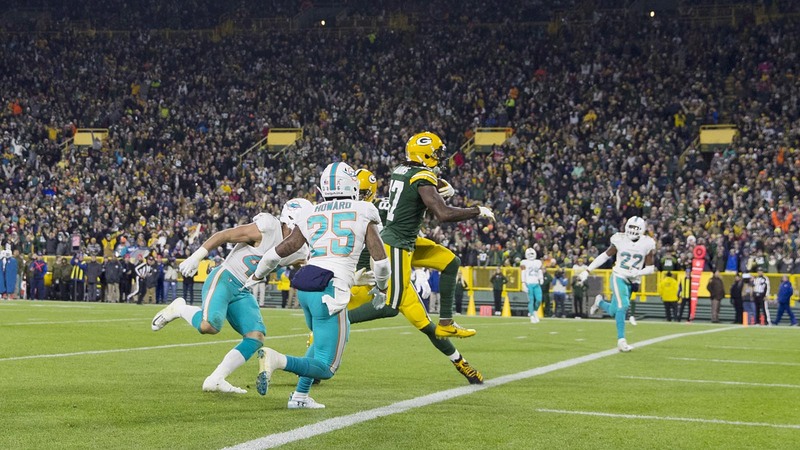 Jones out-snapped fellow running back Jamaal Williams 42-14 in the Packers’ 31-12 win over the Miami Dolphins, his largest share of the snaps this season at 74 percent. The second-year back responded with the biggest game of his young career, rushing for 145 yards and two touchdowns on 15 carries. He tacked on three catches on five targets for 27 yards. Jones’ share of the snaps had been trending up for weeks, but after a costly fumble in an otherwise solid outing against the New England Patriots in Week 10, it seemed fair to wonder if his ascent would continue. Instead, head coach Mike McCarthy handed Jones the keys to the Packers’ backfield. Williams, who had double-digit carries in three of the Packers’ first four games, rushed just three times for three yards. — Marquez Valdes-Scantling has played more snaps than Davante Adams in three of the last five games. — Bashaud Breeland picked up his first interception in a Packers uniform while appearing in 74 percent of the defensive snaps. — Rookie receiver J’Mon Moore, selected in the fourth round in April’s draft, played in his fourth game of the season and was on the field for five offensive snaps. He was not targeted. — Jimmy Graham played a season-low 68 percent of Green Bay’s snaps and hauled in his only target of the afternoon for 14 yards. — Tramon Williams started his second game at safety and played in all 68 defensive snaps.